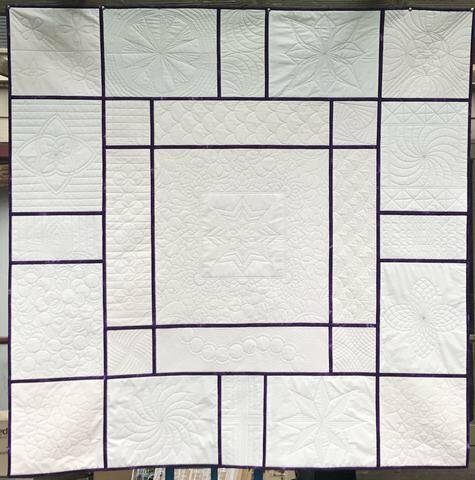 Janet's Ruler Quilt Design Book by Janet Collins Designs takes you from the first stitch to the last. This amazing book of 45 designs is a great reference using the tools in the Westalee Ruler Foot Starter Set, 6-Piece Sampler Template Set, & 8 point 12.5" Cross Hair Square. The 51 page book is spiral bound on 8.5" x 11" paper, for easy reading and referencing. We will stitch a few blocks each month, working our way thru the rulers and the quilt top. At the end you will have a beautiful quilt. You will need the book, Template set, Ruler foot, and Cross Hair ruler for this class. Some of you may already have some or all of these things already! Requirements: You will need the book, Template Set, Ruler Foot, and Cross Hair Ruler.